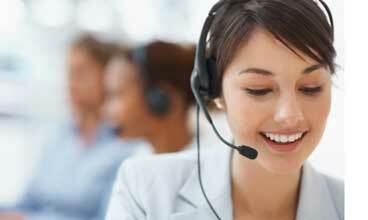 You're already annoyed that you have to dial a customer service phone number to try to resolve a problem. Is it really necessary for you to dial a bunch of random digits, endure "music on hold" and pray that you're not disconnected before reaching an actual human being who can help you? Results Junkies, the developer of FastCustomer, a free app for the iPhone and Android smartphones, thinks not. FastCustomer works simply enough. First you tell the app your phone number. Then you find and select the company you wish to call, from within the app's list of more than 2,500 customer service departments. Finally, you press the on-screen button labeled "Have someone call me." Within a few minutes, your phone rings––and the customer service agent you want is already on the other end of the line. Behind the scenes, Fast Customer's backend system has auto-dialed the customer service department on your behalf, and then called you once the agent has come onto the line, ready to speak with you. If you change your mind before your phone rings, press the "Cancel this call" button that appears on the screen after your request was initiated. It all works well, too––albeit with some limitations. One is that the customer service department you want may or may not be open for business. 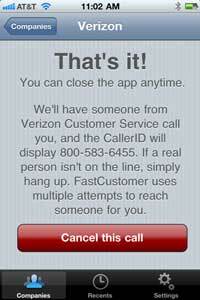 But FastCustomer tells you in plain English whether it is or not, on the same page as the "call me" button. And if the department is closed, the button won't appear and the page states when it will reopen for business. Another limitation is that the app may not actually reach a live person even if it does get through to the proper channel, as I discovered in my recent tests using the app to call both Amazon.com's customer service and Apple's tech support. Both times, my phone rang within three minutes of clicking the "call me" button in FastCustomer. But whereas with Amazon I found an agent on the line, with Apple I was placed into a voice-response system, which asked me to answer questions about the device I was using and the problem I was having. In the latter case, I probably did not save much time or frustration compared with placing the call myself. The list of companies is broad. It includes all banks, airlines, utilities and insurance providers, the spokeswoman says. Yet there are popular companies missing from the list besides. I did not find, for example, The North Face, which maintains a toll-free phone number for its warranty department. 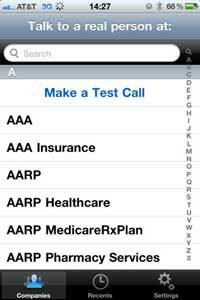 is there a similar program for land line home phone users?? ?